An 1896 Columbia woman's bicycle, made by Pope Manufacturing Company and embellished with gems and gold by Tiffany & Co., is currently on display in the Patrick F. Taylor Foundation Object Project. Its history has proven to be somewhat of a mystery. Recently, we shared a Q&A with conservator Diana Galante, who cleaned and treated the bicycle to prepare it for exhibition. She made some discoveries about the bicycle's physical history that help tell part of the story. Here, I asked road transportation curator Roger White what he has discovered so far about the bicycle's past through documents, photographs, and family history. What is unique about researching this bicycle, as compared to other objects in your collection? The bicycle itself is sort of directing this conversation. What's unusual in this case is how little information there is about the original owner, Mary Noble Wiley, who went by Mittie. We don't know how she got the bicycle and whether she rode it. When curators are actively collecting, there's usually a person out there we can talk to who can provide information. But for something that's been in the collection for 65 years—the bicycle was donated in 1950 by Noble Wiley, Mittie's son—we're always going back and researching. I've made progress but also have come up against some dead ends. What discoveries have been valuable to your research? We came across a letter recently that was in the possession of Mittie's great-granddaughter, Hulit Pressley Taylor. Mittie Wiley's son, Noble J. Wiley, wrote to Tiffany & Co. in 1930 because he noticed the Tiffany name engraved on the bicycle's lamp. Like us, he was intrigued by the ornamentation—the gold, the silver, the gems. Noble Wiley wrote that his mother gave him the bicycle in 1915 to keep for his daughter until she was old enough to "appreciate its value." Fifteen years later, he contacted Tiffany. He said, "Recently I have had occasion to unpack this bicycle and upon cleaning it, was struck by the beautiful elaborate embossing." We don't know the circumstances: Why did he open it then? Did his daughter ever receive it? We know that Mittie was still alive in 1930; did he ask her about it? What did the letter add to your understanding of the bicycle? 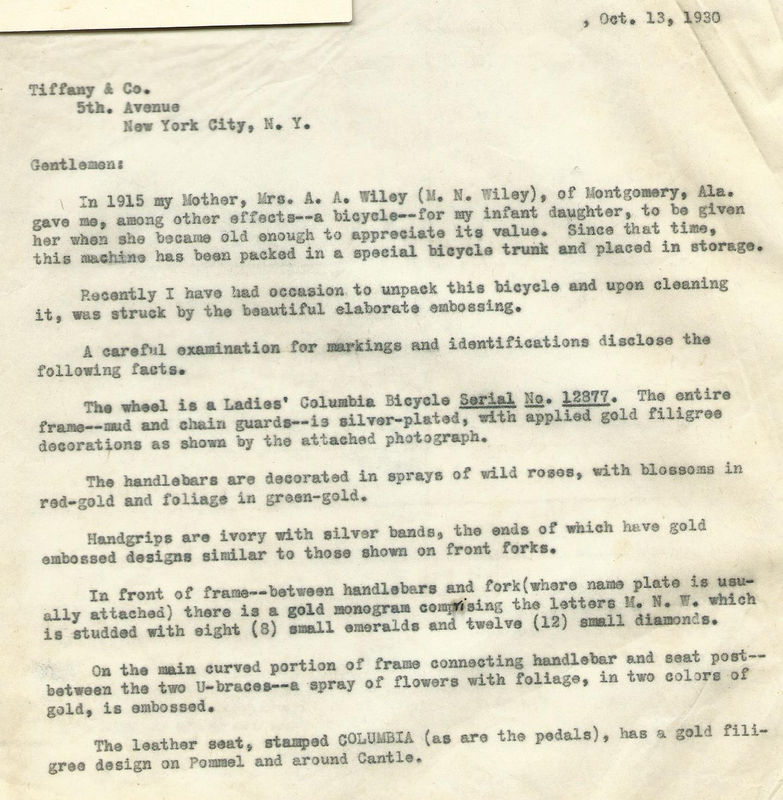 In the letter to Tiffany, Noble Wiley wrote, "from a hazy recollection of statements made many years ago to me by my Mother I am inclined to believe that this exquisite workmanship was performed by skilled laborers and jewelers in your famous firm, presumably for exhibition purposes." That sentence is a tiny window into the origin, the provenance, of this bike. It tells us that the donor himself didn't know much about it. But he believed that Tiffany had this bicycle on display. Perhaps Tiffany showcased it somewhere, and Mittie purchased it later or received it as a gift. But that's just a theory. The Wiley descendants don't have a reply from Tiffany in response to Noble's letter. This is almost like the Hope Diamond. The object affects people, generation after generation. They're fascinated by it, they want to know everything they can, and here we are 85 years later asking the same questions. Does the family tree lead anywhere promising? It does. Mittie had one child, Noble J. Wiley, who donated the bicycle to us. I found that he had a son named Noble J. Wiley Jr., and that both of them are buried at Arlington National Cemetery. To see if I could locate any other descendants, I started with Whitepages.com, and out popped Noble J. Wiley III in Fairfax, Virginia. I thought, "Hooray! He's right here in my backyard." I called that number and Mrs. Wiley answered. She told me to call Bill Brown, who is Mittie Wiley's great-grandson and a genealogist in D.C. I contacted Bill and we've had some great conversations. We had an exciting break recently when Bill e-mailed family photos that depict Mittie and other relatives. These were the first images we had seen of her. So, it sounds like Mittie herself is the most mysterious piece of the puzzle? Yes. We still don't know many specifics about her life. There's more data on her husband, a U.S. congressman named Ariosto A. Wiley, than there is on her. We don't know how she came to own the bicycle or how she used it. I did find Mittie's obituary. Bill found her date of death, from a death certificate. I went over to the Library of Congress and looked it up. She passed away at her vacation home on the Alabama coast. In the Montgomery Advertiser, December 27, 1935, it reads: "Mrs. Mittie Noble Wiley, who died Christmas afternoon at her Winter home at Perdido Beach, will be brought here [Montgomery] for burial." Why is it important to continue research on the bicycle? Curators are always researching the objects in their collections, but a certain object gets more attention when it's about to go into an exhibition. There are 218 vehicles in the collection, and about 60 of those are bicycles. I had researched this bicycle before, and that effort has increased as the conservators, the exhibition team, and I have all worked together to examine its history and prepare it for display in Object Project. Because it has such a fascinating story, the research continues. As we learn more, we'll be able to share new stories. What do you think makes Mittie's bicycle so intriguing? I guess, in a way, the bicycle is our Hope Diamond. Though it does not seem to have a curse—that I know of! It's so interesting that there are these different branches of the research: the physical bicycle, the family, the historical society in Montgomery, and Tiffany & Co. One staff member found advertisements for Tiffany-embellished bicycles that were published during the 1895 holiday season, meaning that there was more than one bicycle like this. We're going to keep pressing forward with these and other avenues and hope we find more pieces of the puzzle. Caitlin Kearney is a new media assistant for the Patrick F. Taylor Foundation Object Project. She is a student in the museum studies program at The George Washington University. Previously, she blogged about the magic cycling scrapbook also on display.